How I Survived My 65th birthday: Dinner at Chez Panisse! Editor’s note: This post was written in July by the very lovely Jane Stillwater, but got buried in my inbox, and is only now coming to light on UM. She says that they accidentally deleted all their pics, but scroll below for some of Mike and Christi’s feast. Sorry for the delay!!! Good grief! Who would ever have thought that I would make it all the way to age 65 without accumulating grey hair, arthritis, a walker or a plot in the cemetery. I’m all proud of myself. But just to make sure that this landmark birthday was tolerable and that I didn’t slip into shock anyway, I splurged and treated myself to dinner at one of the best restaurants in the world — Chez Panisse! My birthday was actually July 1, the beginning of the fiscal year, but they were closed on that day so on July 2, we got all dressed up fancy (I was actually NOT wearing jeans), popped into Joe’s car and drove across town. And what happened next was both magical and weird. First off, it turns out that we knew the waitress. She had gone to school with my daughter Ashley and they had been in the same school play during sixth grade at Willard Middle School. Then we all gushed about the good old days for a while and how sad it had been when their drama teacher, the wonderful Denise Brown, had died suddenly. Then the waitress brought us shot glasses full of something white and creamy. “What is it?” I asked. “But what’s that crunchy taste?” Our waitress called over the salad chef to explain it to us. And he actually came to our freaking table! “It’s konjai — black mustard seeds.” Then we got the actual salad. And we gushed about that. 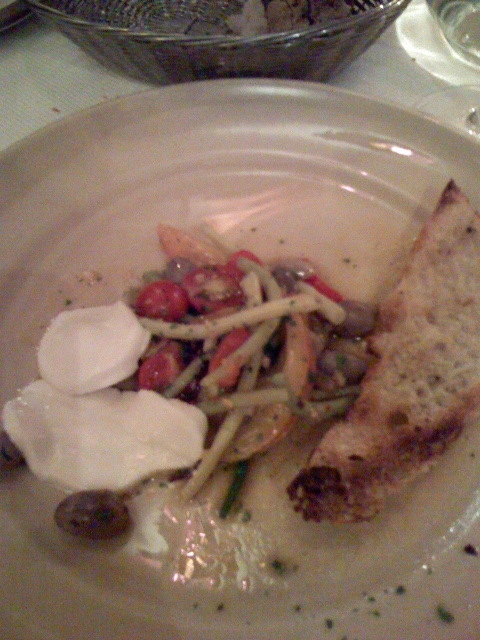 Chez Panisse can make a WICKED salad and they are famous for them — justly so. “Hey, this stuff on top tastes like bacon bits,” said Ashley. We asked the salad chef what it was. “Bacon bits.” And the baby tomatoes were so actually tomato-ish that it brought back memories of the days when a tomato actually tasted like a tomato. 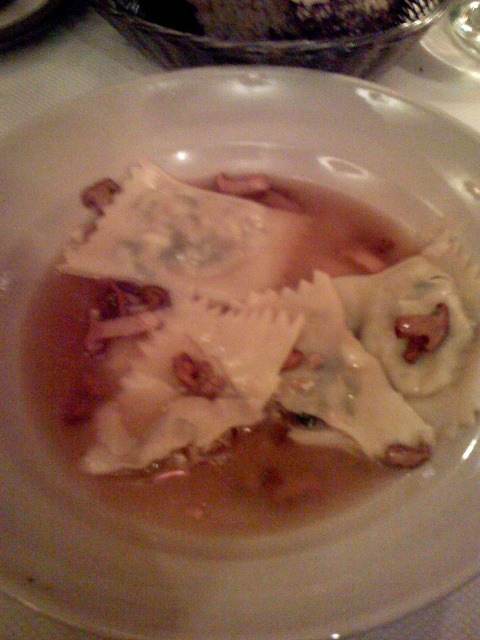 The vinaigrette was excellent. The beets gave it a taste variety. Every salad needs a variety of textures and tastes. “Hey,” said Joe, “There’s an aphid on my plate!” Then we all took a look at the aphid and sure enough there it was, happily crawling around on the edge of the plate. Joe got out his video camera and videotaped it. Ashley whipped out her cell phone and took its picture. Then we watched it do laps around the edge of the plate. It seemed to want to determinedly trudge on forever but by its third lap we got bored. Do you think that we should tell the waitress?” I asked. “Maybe that’s where the crunchy taste came from,” added Ashley. We all rolled our eyes. Then Joe and I split a glass of excellent red wine. In very fine glassware. “This is is even as good as 2-buck Chuck!” I exclaimed. Laura wanted to taste a sip too but we all yelled “Fetal Alcohol Syndrome!” at her and rolled our eyes. Again. Major eye rolls are a Stillwater family tradition. “But I only wanted a sip,” said Laura who is actually a totally conscientious pregnant person. Oh, okay. The wine was good and the salad had a good after-taste and the bread was good and the butter was better. “Do you want still water or sparkling water with your dinner,” asked the waitress. Meanwhile Ashley was eye-ing the steak knife. “This is a really good knife.” But we persuaded her not to steal the silverware. Then they brought us the main course. “The green beans are perfect and the corn custard is to die for but the chicken is not all that good,” I said. “Ma, you have been expecting too much from that chicken,” replied Joe philosophically. “That’s just the nature of chicken. It’s hard to mess it up but its also hard to make it really good either. It’s the dynamic, Ma. Chicken can only be taken so far.” Chicken dynamics? Okay. 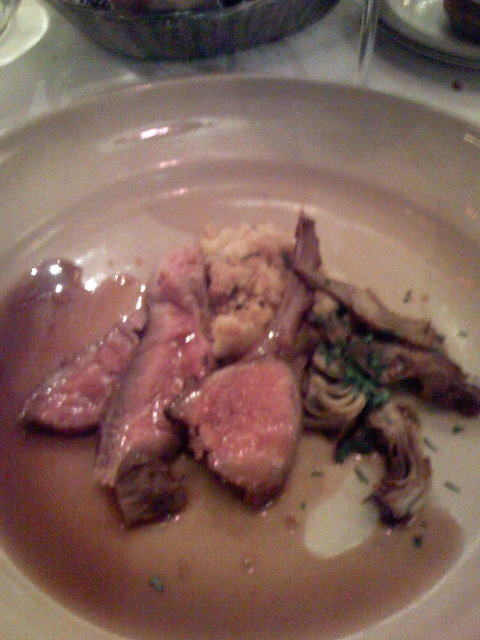 But the sage leaves under the skin gave it lots of flavor and the sauce was good. Chicken dynamics? In the meantime, Ashley was DETERMINED to try to eat her drumstick with her new friend the knife. But not me. I wanted easy access to every bite of that chicken. This was a fifty-dollar chicken! To hell with the knife. “Would you like coffee or sherry with your dessert?” asked our waitress. Do you have to pay extra for it? “Yes.” Sigh. I bet they make really good coffee but we were already over the budget on the wine. And Ashley then informed us that 10% of everything we drink gets backwashed. Eeuuww. Ah! The dessert. With a candle in mine to celebrate my birthday. I made my usual wish, the old Buddhist favorite, “May all beings attain the Pure Land in this lifetime.” Apricot tart. Handmade ice cream. Yes yes yes. Then, for a thoughtful final touch, the waitress brought us a small plate of wild strawberries and pistachios rolled in cocoa paste. We almost ate them all up before we remembered to get a photo of them. The bill came to $263 but we had saved up. You only turn 65 once. “Why you all the time hatin’ on the aphid!” said Ashley. Her favorite part was the salad too. Everyone agreed that the salad was primo. “And I liked the tart,” added Joe. “It had a good aftertaste.” And just as we were walking down the steps to the garden in front of Chez Panisse, our waitress came running after us and gave us all a hug. “Happy birthday!” It was the perfect ending to a perfect birthday dinner. And as we left, a fire truck and ambulance came roaring out of the night and parked next to the restaurant. “Do you think they are going to Chez Panisse?” I asked. “If they are”, someone replied, “that would be giving a whole new meaning to the term ‘food to die for’!” We all laughed. The food had certainly been heavenly. Except for the chicken. But Shhh! Don’t tell Joe. 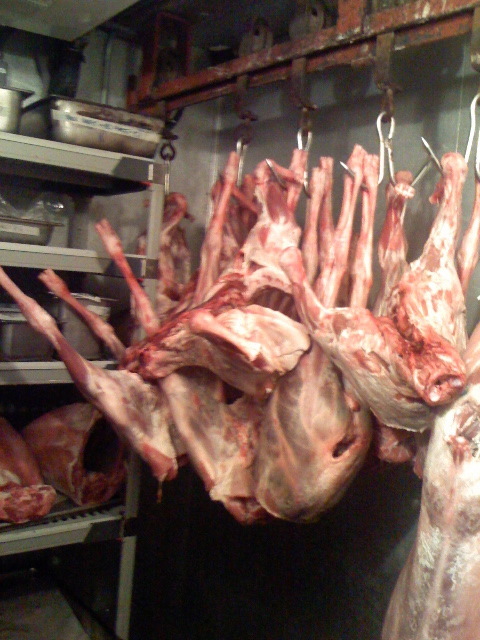 Editor’s note (again): These pictures below are of Merriberry’s trek to Chez Panisse last month. They got to go back into the kitchen- which Christi says was the highlight of the meal for both of them. These photos were taken on Mike’s iPhone, in case you were curious about the phone’s picture-taking quality. 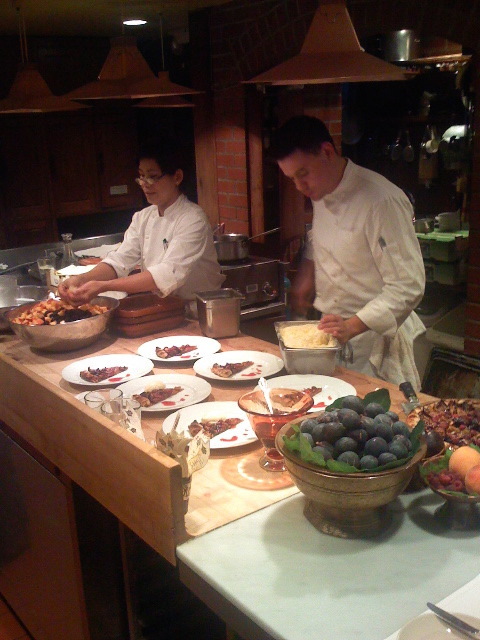 Pastry chefs preparing the night’s fig tarts. Sorry no pics of those! I was raised in the most Republican town in Northern California. Very early on in life I learned to always expect the worst. And guess what? The worst always arrived — like clockwork. I live in a housing co-op that’s run by a bunch of self-interested schmucks whose only goal in life appears to be to see how many of their relatives they can move in illegally. And because I’m a whistle-blower, they keep doing nasty things to me and it looks like it’s only gonna get worse. “Expect the best, Jane.” Yeah, right. But what if the schmucks and me meet over tea and they offer to give up their greedy ways and we patch things up? Hey, it could happen. So. Where does the sushi and chocolate come in? Good things are also happening to one of my daughters. After graduating from high school, she floundered around a lot — many young people do. But now she’s got her own apartment and a new job! I’m so proud of her. I gotta admit that I had expected the worst — but now look at her! Hurray! And, even better, my daughter now works with food. “If you come over, I’ll give you a free sample,” she said last night. What can be better than that? It turns out that my daughter works in a delightful little secluded indoor alleyway in North Berkeley’s “Gourmet Ghetto” — three doors down from Chez Panisse, only not that expensive. Let me take you on a tour. Located at 1611 Shattuck Avenue, its entrance is innocuous. If you didn’t know it was there, you might miss it. “OMG, look!” I exclaimed. “Kirala has a carry-out place!” The best sushi bar in Berkeley has just gone on-commando. Sushi-to-go! And bento boxes too. And udon. 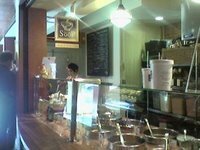 Then there’s Soop, a specialty food bar featuring soups made right on the premises and served with a chunk of warm buttered corn bread. “Our soups are completely organic,” the counter person told me, “except for the onions. We can’t seem to get enough organic onions.” Good to know. Next comes Picoso, a small kitchen alcove that sells Mexican food with hand-made salsa. “And they make their own guacamole,” my daughter whispered in awe. 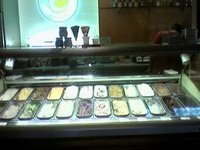 Then there’s a gelato counter named Ciao Bella that offers a whole rainbow of gelato flavors. I tried a scoop of their chocolate jalapeno and my friend Abhi tried their pistachio. Delicious. And the young lady behind the counter was very cheerful and helpful and funny. I left a whole quarter in her tip jar — I was that impressed. And way in the rear of this delightful food-court wannabe is a tiny little cubby that sells the best chocolate in the world, called Alegio. “Ours actually IS free-trade chocolate,” said the proud proprietor. “Would you like to try some of this dark chocolate imported from a co-op farm off the coast of West Africa?” Would I! The whole alleyway smelled totally wonderful. Rich aromas battered my senses. Hey. Forget about blogging my poor fingers to the bone and substitute teaching at juvenile hall for a living. I wanna work HERE. Oops, I almost forgot. Up above the waterfall is an old-fashioned Chinese tea shop called the Imperial Tea Court, modeled after the kind that Chinese poets used to frequent back in the day. they sell freshly-made noodles and every kind of tea. “And be sure to say that the noodles are hand-made,” my daughter informed me. The people who run these shops are mostly small-business owners, taking a chance on the American economy because they love to make and sell food — and chocolate. I hope their efforts succeed. My son and his significant other are expecting a baby on January 1 — so 2008 looks like it’s going to be a good year too. And I turn 65 in two weeks. You know what that means — cheaper transportation rates, senior benefits and Medicare! Plus maybe we’ll finally get a president in the White House who actually cares about America and not just about pulling off the biggest heist in the history of the planet. PS: I really don’t eat all that much chocolate any more. Since I started my new high-fiber diet, I’ve noticed that my legendary craving for sugar has gone way, way down. But unfortunately there’s no fiber in chocolate. But maybe they could start making chocolate-covered salad? Chocolate-covered roast beef? Chocolate-covered All-Bran! You are currently browsing the archives for the Berkeley category.